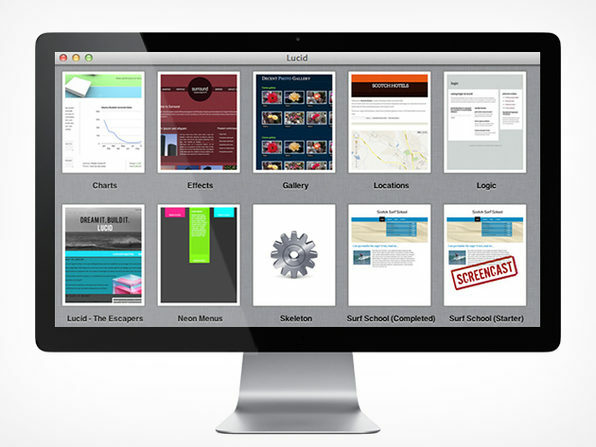 Get 10 Explosive Mac Apps. Donate to Charity. Pay What You Want. 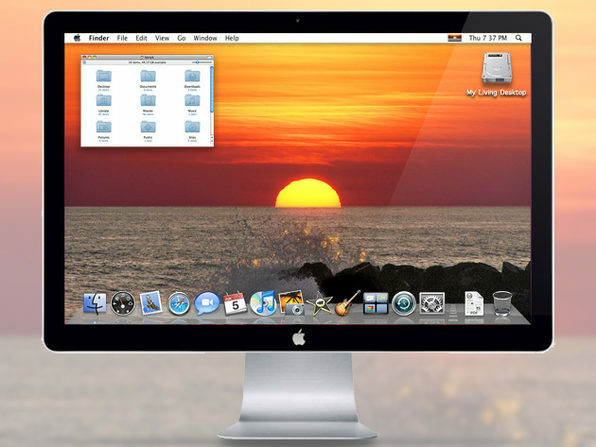 Want to EASILY record a screencast right from your Mac? 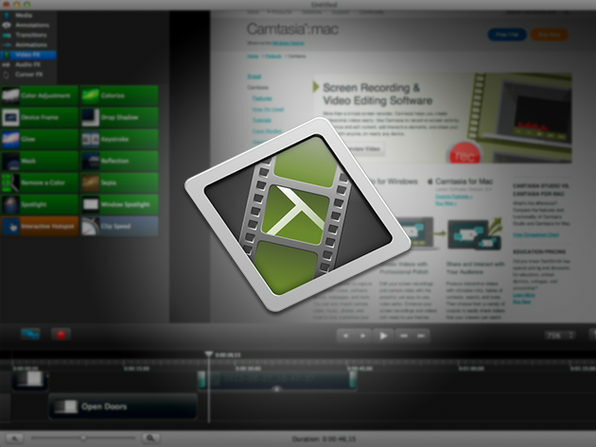 Let us introduce you to Camtasia, one of the BEST screen recording and video editing Mac apps on the market. TechSmith’s Camtasia will give you flexible recording options, professional yet easy-to-use editing tools, plus web and mobile sharing capabilities so you can show your incredible video screencasts to the world.  In today’s digital era, VIDEO is becoming an extremely important tool when it comes to making how-to videos, hyping up a company brand, delivering a webinar, building a personal blog, or even communicating a process. Camtasia is a powerful application that can turn practically anyone into someone churning out high quality and professional screencasts. Have you ever wanted to easily run Windows applications & PC games on your Mac? 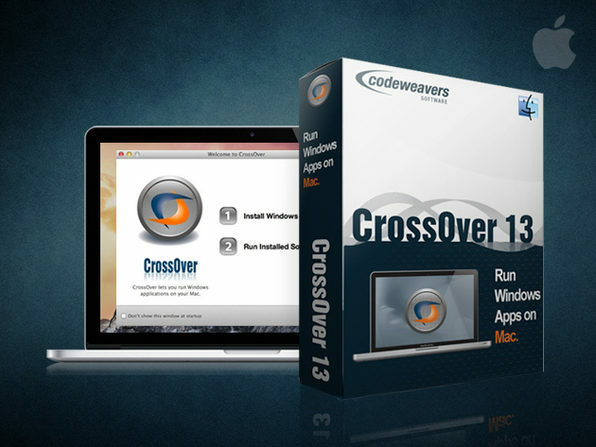 CrossOver 13 has you covered and now you can install your Windows software right onto your Mac without a Windows license, without rebooting, and without a virtual machine. Your Windows applications and games integrate seamlessly on your Mac OS X and run alongside your other Mac applications. Let’s face it, there are some great Windows applications and PC games that we’d love to run on our Mac but due to compatibility issues we’ve just been out of luck…until NOW. Now you can get the best of both worlds. Are you having trouble finding your documents? Now you can stop spending hours trying to find that document you saved 6 months ago. If your desktop look anything like ours, you probably find yourself squinting at the screen to find that one document that you know is there… you just can’t remember where you saved it. Well, problem solved. Now you can get this POWERFUL piece of software that will save you days over the course of a year. Who doesn’t hate being UNABLE to find the document you’re looking for? 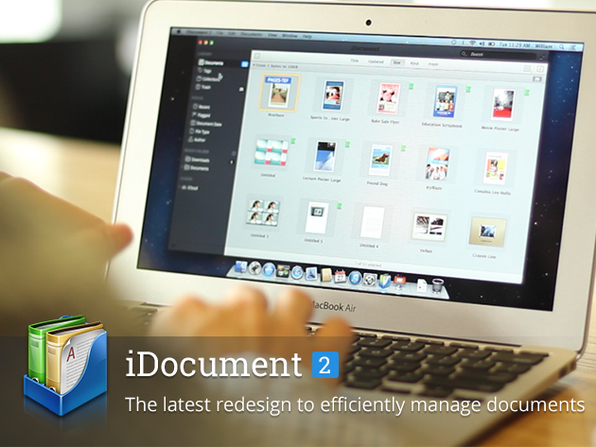 iDocument 2 solves that problem with its intuitive and easy-to-use interface. Any application that helps us save time and keeps us sane is a winner in our minds. iDocument does that and so much more. iDocuments centralizes your documents and condenses the 50 folders that clutter your desktop into one easy to access spot so you’ll always know where to find your documents. After you have all the documents stored in your centralized library you can start viewing your documents in different ways. “This software is great for keeping all of your documents together in one place.”— Vincent T.
The Mac OS X uses great voice synthesis, but let’s face it, it’s limited. You can’t necessarily assign voices to your text and, if you wanted to hear what “different folks” have to say – like in a group or a meeting, well, that’s really limited too. 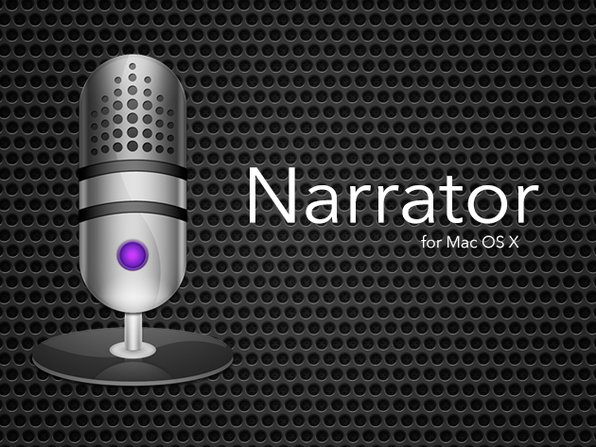 Narrator, one of the only text-to-speech solutions for the Mac, changes all of that. This is a POWERFUL Mac app will bring all of your text to life by reading it to you using voice synthesis; your letter, an ebook, emails, online news – or any other text. You can choose different voices, rates, pitches, inflections and volumes for each character you assign, giving your text a wide range of expressiveness. Sometimes it’s nice to take a break from reading everything that comes before your eyes. With Narrator you can turn all your text into a voice that will read anything to you. Just paste any text into Narrator and your text will start to play with the click of a button. Just paste your text into the window or import an RTF, .txt or .doc file into Narrator and your letter, story – any text – is brought to life using voice synthesis. That business letter you’re ready to send to a prospective customer? Have Narrator read it out for you and you’ll know right away if what you wrote is what you want to have read. You can also export speech directly to iTunes, where you can listen to it over and over, or sync it to your iPad, iPod or iPhone. To help you improve the pronunciation of tricky words, Narrator includes Dictionary preferences. You enter a list of words to look for, and words or phrases to use instead when speaking. Click HERE for their Mac360 review. Click HERE for their Macwelt review. Click HERE for their Softpedia review. Have you ever wanted to hide specific files and folders so your friends, family, and / or colleagues can’t access them? It’s never good when someone comes across something their not supposed to and now you’ll never have to worry about it again. 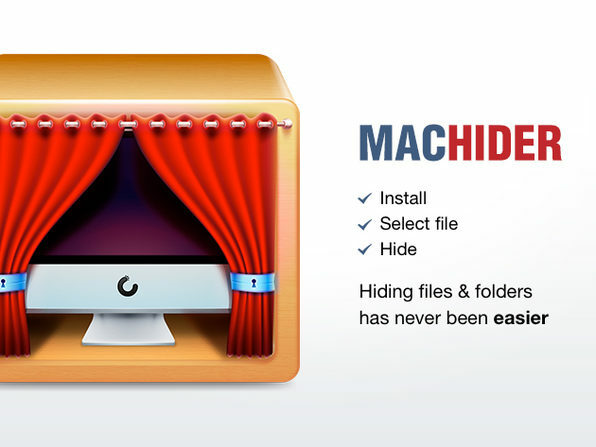 MacHider puts your Mac on lockdown so when you’re not around to protect it, it will make sure all your “secret” documents and files are safe and sound. Privacy, privacy, privacy. Who doesn’t love their privacy? MacHider makes sure all the files we don’t want accessible to the outsiders running around our office are safe and sound. Now we can leave our computers on without having to worry about someone discovering something they shouldn’t. It’s as simple as that. Hide those files by using the contextual menu in Finder, adding the file from MacHider’s menu or dragging and dropping them into MacHider. An unlimited number of files can be protected at once. Effective protection techniques allow you to hide files and folders from other users without changing them. You won’t lose any files during the hiding process. Your private files and folders can be organized into groups, so you may easily and quickly locate them whenever you need. The Require Password Protection lets you protect MacHider with your own password. If you select this option in the Preferences Pane, then every time MacHider is launched it will require you to type the password. Imagine having the power to create amazing 3D models, scenes and worlds by simply typing text commands. 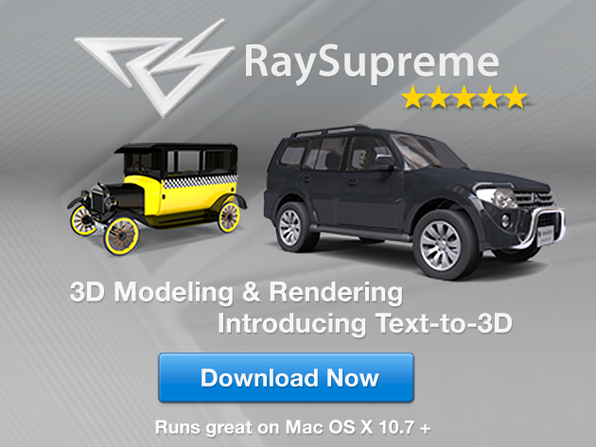 RaySupreme is a powerful, full-featured 3D modeling and rendering software that introduces a new innovative technology called Text-to-3D to make your 3D models come to life. This new approach allows anyone, from beginners to professionals, to easily create exceptional looking 3D. It’s the first and only full-featured 3D modeling, texturing and rendering program that introduces a groundbreaking new technology called Text-to-3D. We’re all about innovative technology and this allows anyone the ability to create striking 3D images, scenes and worlds simply by typing text descriptions. It’s revolutionary and it’s easy. Two attributes that bring so much value to this application. Ever want to watch your favorite YouTube videos without waiting for them to buffer or having to connect to the Web? 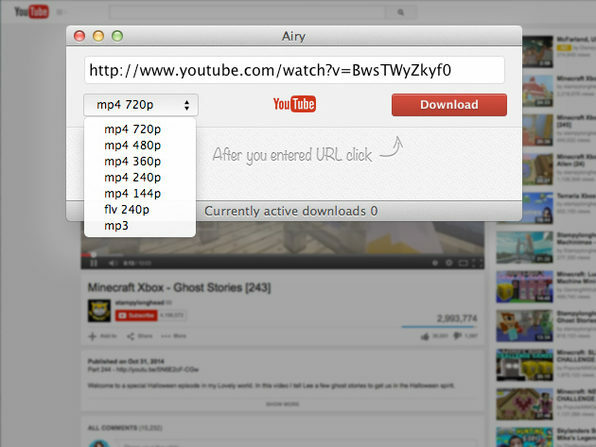 Check out Airy, a premium YouTube downloader for Mac that saves videos to your computer for easy access. Whether you’re starting a collection of your favorite videos to view on your desktop, or extracting MP3s to take your favorite media on the go, we think you’ll agree: the versatility that Airy provides is unbeatable. Looking for a mental vacation? My Living Desktop brings a whole new dimension to your computing experience by turning your Mac’s desktop into a beautiful, moving environment…even complete with soothing sounds. The app provides a wide array of stunning, relaxing high definition video scenes that’ll run right on your desktop just like a screensaver. You can even import your own movie segments to create a truly personal and unique desktop environment. In today’s age we practically live on our computer so it’s nice to bring your favorite vacay spot right to your desktop so you can take a mental vacation every once in awhile. My Living Desktop does more than that. With it’s “video screensaver” capability it makes you feel like you’re actually at a dreamy little paradise. If you’re looking to take more mental vacations right from your desktop look no futher. Lights, Camera, Action: with its video importer, My Living Desktop lets you import your own movie scenes. Many Scenes to Sooth the Soul: comes complete with 28 stunning high definition screen saver videos. Software With Manners: sports robust auto-disable and auto-mute features. Serenity Now: with it’s auto serenity break feature, you stay in tip top mental shape. With the purchase of this bundle you’ll also receive an email from My LIving Desktop that will give you a coupon code for $10 off any additional scenes. Please click HERE to check out your options! Keeping track of home inventory is one of the most important things you can do for peace of mind and insurance purposes. We don’t like to consider the worst, but if a catastrophic event were to cause serious damage to your home or belongings, would you be able to piece together everything that was lost? 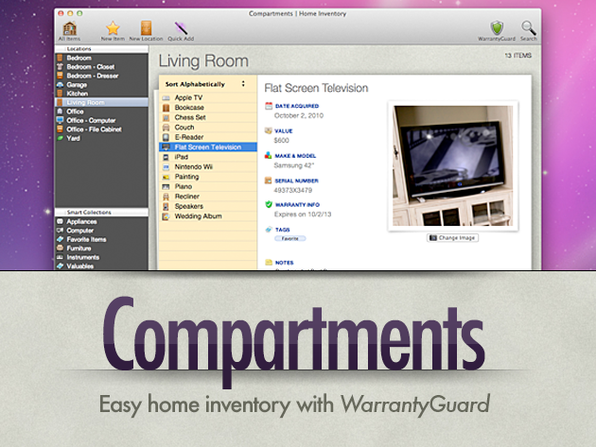 Take stock of your estate with Compartments, the simple home inventory application for Mac. With a beautiful, user-friendly interface, it makes entering and categorizing items a breeze so you spend minutes, not hours, entering data. Enter dozens of items in seconds with Quick Add and apply tags to multiple items with Quick Apply, then generate an inventory report that automatically calculates estimated value of everything. We know some things are irreplaceable and that’s why Compartments is here to help ease the pain in case anything does ever happen. We know that collecting inventory can be a burdensome task, but we also know that the feeling of security you get when you know everything is accounted for is worth it. Compartments makes this process so streamlined that there’s no reason why you shouldn’t know what’s in your possession. With one click, you can generate an inventory report of all or some items and the app automatically calculates the total estimated value of everything. Stop filing away all those serial numbers, receipts, and warranties, Compartments keeps track of all that info and WarrantyGuard will warn you of warranties expiring soon. Never forget where you put something ever again. Search for anything by name, tag, or type and save the search as an auto-updating smart collection so you can quickly find any item in the house. Dropbox and MobileMe integration allow for automatic syncing across multiple computers and keeps your data safe. Keep everyone up-to-date with item locations because one Compartments license works for every computer you own. If an item doesn’t come with a serial number, prove you actually own it with a picture.